Tens of thousands are discovering the Hebraic Roots of their Christian Faith - but is Hanukkah Scriptural? 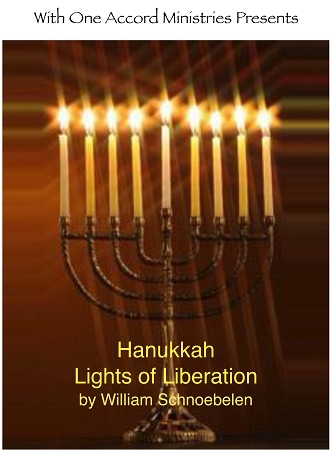 This Biblical teaching by Dr. William Schnoebelen examines the history, symbolism and Scriptural foundations of Hanukkah that you need to find Yahushua Messiah (Jesus Christ) in this Festival of Lights! Dr. Bill addresses Spiritual Warfare and Deliverance weaponry provided through observance of Hanukkah, and how this special dedication is an ANTIDOTE to the dark rituals of Freemasonry, Baal worship and the defiling spirit of Legion. DISCOVER the wonders of Hanukkah - and how to cleanse YOUR temple in preparation for the coming of the Messiah! THIS DVD CONTAINS VITAL INFORMATION ABOUT YAHUSHUA (JESUS CHRIST) and HIS FEASTS!